Savoury cookies are not new. But many patisseries in Singapore are presenting full-flavoured goodies that transcend the plain and tame chocolate-chip-sprinkled-with-sea-salt sort. More appetizers than desserts, these small salty baked morsels are sure to tickle your taste buds without your body experiencing a sugar overload this Chinese New Year. So go ahead, savour a cookie or two. We’ve also included an intriguing-tasting macaron on this list, just to spice things up. The distinctive spicy and sour taste of Thailand’s pride and joy, Tom Yum, is wondrously crammed into these bite-sized savoury cookies, made by the good folks at The Pine Garden. Get a kick by biting into the buttery bonne bouche of sugar, lime leaves and tom yum paste topped with dried sakura shrimps. Be warned, these are addictive. For the Year of the Dog, Bakerzin presents eight cookie flavours in a box. These range from the usual sweet offerings of Coffee and Chocolate to the somewhat offbeat Cereal Salted Egg Yolk and Thai Milk Tea. But we have our eyes set on the Charcoal Black Sesame — a perennial favourite with a toasty sesame fragrance. It is the absolute cookie with a hint of savoury, sprinkled with sesame seeds on the side for an extra crunch. The latest Antoinette Singapura Cookie Tin consists of six special flavours made from local and premium ingredients. Cookies come in Singaporeans’ all-time favourite dessert of Ondeh Ondeh. And while the Kopi Susu variety, made from freshly grounded coffee beans, seems intriguing; it is the curry and cheese cookies that has got us all hyped up. The palate-pleasing infusion is bound to excite all gastronomes. Bak Kwa, the sweet and savoury barbequed meat jerky, is the definitive Chinese New Year treat to consume in this country. So there’s no surprise here that its unique flavours had been incorporated into a cookie, by none other than daring dessert queen, Janice Wong. 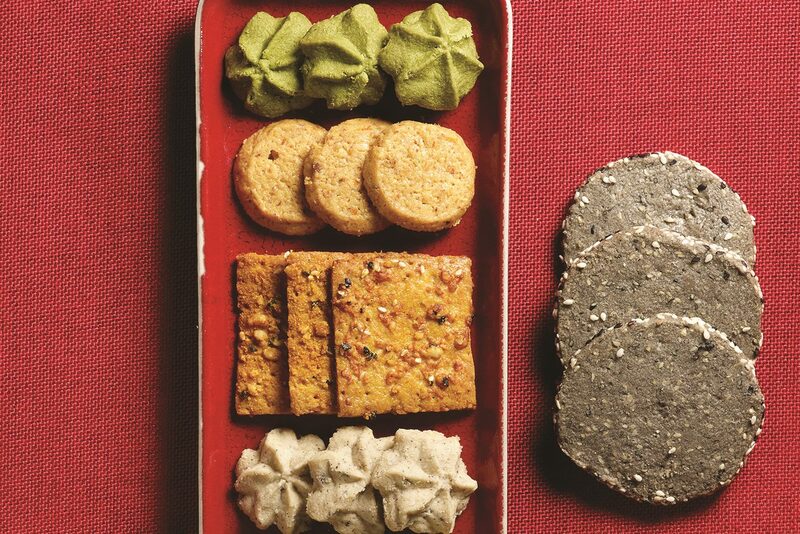 Another spicy number from The Pine Garden is its Togarashi Seaweed cookies. This batch uses the Japanese seasoning blend, also known as Shichimi Togarashi, which includes coarsely ground red chili pepper, orange peel, nori and more; plus other Japanese ingredients such as shoyu and seaweed. It may look sweet and innocent, packaged like a run-of-the-mill orange-tinged macaron. Yet, this unassuming morsel packs a pungent punch. Inspired by old-school Orh-Nee, or yam paste, each macaron has a coconut-dusted almond shell sandwiched between candied pumpkin, fried shallots and coconut yam cream that tastes more savoury than sugary.